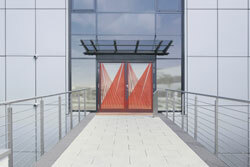 Pepperl+Fuchs: Automatic doors are an integral part of modern building technology. Sensor solutions used in this field must fulfill demanding requirements. This is where the DoorScan from Pepperl+Fuchs sets the benchmark. The solution combines maximum safety with optimum flexibility and a perfect installation concept. The DoorScan is a presence sensor for doors up to 3.5 m high that scans the areas directly in front of and behind swinging doors to protect people and objects from colliding with the door. The universal system ensures reliable detection in any situation thanks to intelligent wall suppression that functions even when doors are fully open. The convenient snap-in mechanism enables modules to be mounted quickly and without any tools, and the system is commissioned by simply pressing the Teach button. The DoorScan from Pepperl+Fuchs works according to the active-infrared principle with background evaluation and is suitable for operation in both a stationary and moving position. The presence sensor forms a continuous detection field on each side of the door. If a person or object passes through the protective beams near the door, the door stops moving immediately. To ensure the safe operation of automatic doors, it is crucial that people and objects are detected quickly and reliably when they approach the closing edges. The slightly inclined position of the outer monitoring beams enables the DoorScan to offer increased safety at the main and hinge edges and protects people and objects from colliding with the door. The angled outer beams are switched on/off using a DIP switch. Intelligent wall suppression allows the DoorScan to provide complete protection up to the wall without sensor shutoff. The wall is automatically taught in during commissioning at the touch of a button, ensuring optimum collision protection up to a full opening of the door. The integrated wall suppression can be switched off and shortens commissioning if no wall is present. Mirrored walls, dark mats, polished stone slabs or gratings in front of the doors do not pose a challenge. When unlocked, the modules of the DoorScan can be moved freely in the sensing strip. The width of the detection field increases or decreases depending on the distance between the transmitter and receiver modules. This expanded sensing area enables precise adaptation to various door widths and therefore maximum flexibility when using the DoorScan. The DoorScan is compatible with any door drive. With its slim, well-designed profile, the solution is an understated addition to modern door design.